Simple, fast, and low-cost, Geotextile Dewatering Tubes are becoming the go-to paper mill sludge dewatering filtration method. Made with quality components you can count on, Geotextile Dewatering Tubes by GEI Works provide budget-friendly pricing and reliable performance. Geotextile Tubes are a popular and versatile paper mill sludge dewatering method. Unlike other sludge dewatering equipment, geotextile tubes need very little maintenance and require no presses as gravity does all the work. They're quick and easy to install, can be customized to fit specific space requirements, and contain the paper mill's processed sludge neatly for transport or disposal when done. We provide Geotextile Dewatering Tubes specifically for paper mill sludge processing. Our dewatering tubes can be customized to suit nearly any specifications and size. GEI Works' Geotextile Dewatering Tubes will also easily accommodate the use of polymers to speed up liquid removal by expediting the concentration of solids in sludge processing. Contact us for details, options and pricing! For lining sludge dewatering tube pits and processing or directing the effluent resulting from sludge processing, we carry bulk rolls of geotextile fabric in a wide selection of fabric weights, styles, and degrees of permittivity (non-porous PVC fabric is also available in bulk). Sludge dewatering solutions are available in many shapes and sizes. For a full listing of our dewatering products, see: Taurus Dewatering Solutions. 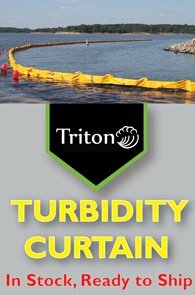 Use Triton Staked Turbidity Barrier as an emergency overflow or stormwater event compliance control for dewatering and sludge processing sites. PVC Staked Silt Barriers direct water flow to controlled filtration exit points on the jobsite. Silt (Geotextile Filtration) Fencing is also available. Key to staying in compliance and avoiding regulatory fines, use the Turbidity Meter to test the sludge dewatering tube's effluent. Measure the Total Suspended Solids (TSS) to determine the effectiveness of your dewatering controls. Questions about sludge dewatering methods? We can help! Call the GEI Works team at 1-772-646-0597 or fill out our quote request form to discuss your requirements.